I think that it is May 2, but at this point, I hardly know I name. Yes! I know that I have said nothing of Manchu Picchu. I will. I will. The Ramblers called the first leg of our trip “The Six Faces of Peru”. Imagine visiting the Everglades, Death Valley, Yellowstone, New York City, the Grand Canyon and the Red Wood Forest in just 18 days. Yes, Peru is smaller in area than the United States, but if you were to put Peru and the Andes under a flat-iron, Peru would ooze out and easily equal the United States in area. We are now travelling with Manu Expeditions for nine days. We are in the jungle. Electricity is on from six to eight p.m. We are encouraged to use candles and carry flashlights. Some places have hot water – other places only cold. We wash our clothes, but because of the humidity, drying them is a problem. We wear rubber Wellingtons because of the mud. The smell of my socks alone could wipe out an entire population. Despite our showers, we are pretty ripe. Because there are no roads, we travel with backpacks by boat. Obviously we do not have Internet. Despite these small inconveniences, we are happy and cheerful. We have had enough of city life. As we left the Cusco airport, three young boys gave us the sign of the cuckold: thumb and pinky up – three middle fingers down. It is universal sign for F**k You! Apparently not everyone thinks that tourism is the answer. It strikes me that the competitive nature of cities, brutalizes those who live there. In the eat-or-be-eaten nature of city life, those who eat are more aggressive; those who are likely to be eaten withdraw into themselves. Those who live in the country may be worse off economically but because they feel safer, they are friendlier and less guarded. Only one road travels south from Cusco, and it is primitive at best. We leave Cusco at 11,000 feet and drop down through the clouds. We aim for the Manu National Reserve. We are the first tourists to follow the rainy season which supposedly concluded at the end of April. The road is precarious at best. We shut our eyes for fear of looking over the sheer precipice. It is a road that leads to thinking of faith and fate and how you would like to be remembered once you have passed on to the Great Beyond. I could not look over the precipice. I thought a lot about my seatbelt. If the bus went over the edge, would it be better to have a seatbelt and burst into flames on landing or would it be better would to ride without a seatbelt and suffer a concussion or break my neck on the way down? With a 2,000 foot drop, I would most certainly die. I decide to wear my seatbelt only at lower elevations where vegetation might break our fall. Five people plunged to their death last week. We could very possibly be next. Every five hundred yards or so, a waterfall flows across the road. The mist, the rain, and the jungle are fecund: orchids, bamboo, banana trees, mangos the size of melons, eight-foot palm fronds, and a cacophony of birds and monkeys call out to us. We pass through a couple of villages. With few exceptions, the housing is catch-as-catch-can. A board here, a piece of scrap lumber there, the shacks are built on stilts and surrounded by mud. For a roof, maybe a tarp or if the family is flush, a tin roof. Chickens, pigs, and dogs litter the yard; washing is draped over railings; transport is by bus or foot. I am humbled by the people’s tenacity to survive despite odds that would destroy the rest of us push-button-people. The mud is ankle-deep, and yet the washing, undertaken in a nearby stream, is clean. Dogs are thick as fleas. Every toddler has a puppy in his arms. In the city, you would pay a sol (33 cents or so) for a privilege of taking their picture. In the countryside, the children are just grateful for being recognized. Dogs are to Peru as cats are to Sicily. The female dogs are either currently nursing pups or have just finished doing so. The Navajos have been known to eat their puppies; do the Peruvians supplement their diet with puppies also? One of the saddest things I witnessed was a yellow dog playing ball with a flattish, oval stone. The dog would push the stone along the sidewalk with his paw, chase the stone, mouth it, drop it, and bat it down the sidewalk again. At one point, the stone skittered off the sidewalk. I picked up the stone and skimmed it back in play. Immediately the dog chased the stone and picked it up in his mouth. What a sad state of affairs to be playing ball with a stone! This image will stay with me for a long time. The money we spend on our pets is more money than the average Peruvian family spends on food. Likewise, the children make do with very little. Older boys may have a bike, but younger children seem to be always at-work: spinning, washing, harvesting, herding, laundry, and childcare. Play? I don’t think so. The beauty of Altiplano terracing is that going back to Pre-Inca times, it follows the lay of the land. But finally, coming down from Cusco, I saw furrows that ran with the slope of the mountain. I was looking for this out-dated practice because I remembered a story told by an acquaintance who had served with the Peace Corps. He told the story with some embarrassment – laughing at his own ignorance and naiveté. Sent to Peru in the late 60s, he had been assigned two goals: to introduce the native population to the Irish potato (so much bigger than the Peruvian potato) and to demonstrate contour planting. For two years this poor misguided volunteer labored to make his impact on the local culture. Under his supervision, the Peruvians planted the Irish potatoes on the plots to which they were assigned, but on their own land, they continued to plant the small purple Peruvian potatoes. Nearing the end of his two years of service, the Peace Corps volunteer went to visit some of the local farmers, and on seeing them at work on their own plots, he had a moment of clarity. 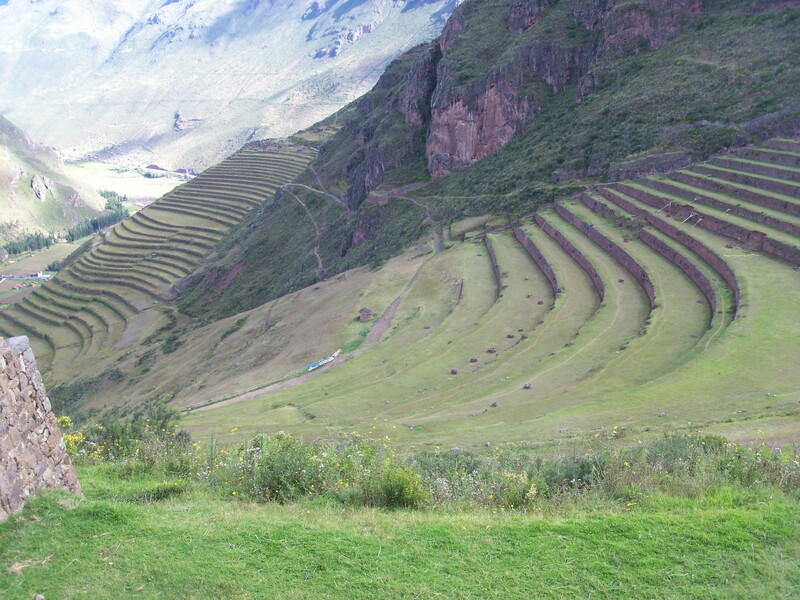 He already knew that the Peruvian potato tasted superior to the Irish, but as he watched the women working the steep hillsides, he realized that if the plants had followed the contour of the land, the women would have had double over to tend their crop. With the crop running up and down the slope, the women stood below the crop and given the incline, they hardly had to bend over at all. I include this story to illustrate the danger of imposing the practices of one culture on another. Dear Doris, thank you for these wonderful reports. There is just one thing that buffles me: “One of the saddest things I witnessed was a yellow dog playing with a stone”. Are you sure that this was one of the saddest things you saw? Really? Dear Helga, Well, no. The dog playing ball with a stone wasn’t the saddest thing I saw. (If I get caught up on my blogs, I’ll write about the sadder bits.) However, it is very true fact that animals often capture our attention more than people do. You probably remember the whale that swam up the Thames a couple of years ago. Despite more pressing human problems at-home and abroad, everyone’s attention was glued to the plight of the whale. I think our empathy for dumb animals is that they come with no ethnic, political or religious labels. It’s the labels that divide us and sap our empathy. Why do you call animals dumb? In this case, my use of “dumb” was hyperbole. Dumb animals in contrast to so-called smart humans.